My article at "Create a Task from an Email using a Rule" shows how to create a task from an email message but what if only want to include the actionable part of the message in the task? You don't actually need a macro to do this - Outlook has a pretty cool feature built in that makes this easy: just select the text and drag to the Tasks button on the navigation pane and drop. A new task form opens with the selected text in the task body, ready for you to fill out the subject and dates. You can drag text to any folder to create an item with the text in the body field; this method can be used to create an appointment, contact, new message, or a note.It's not limited to content already in Outlook - you can drag a selection in a web page in Edge in Windows 10 (this worked in IE in old versions of Windows & Outlook) or Word. If an application doesn't support dragging, you can copy and paste in a folder to create a new item. You'll need to use Ctrl+V to paste after clicking on the list pane - the folder should be highlighted gray (inactive selection), not blue. While you don't need a macro to do this, using a macro can save time. It can automatically add a subject (any predefined subject of your choosing, such as using the sender's name, received date, or message subject) and it can set start and due dates. Dropping text on the Task button creates the task in the default Tasks folder; a macro can add it to a different tasks folder. If you're not good at dragging (not ususual if you're using a touch pad), a macro is one click. If you routinely create tasks using content copied from other applications, a macro can create the task using the content on the clipboard. To use this macro: Select the text you want in the Task then run the macro (add it to the ribbon for easy access). If you want to copy the entire message body, the macro can select it for you, by adding .WholeStory before the .Copy line. This macro creates a task with a date date 3 days from the email's received date and adds the original message as an attachment. The formatting of the selected message carries into the task (including images). 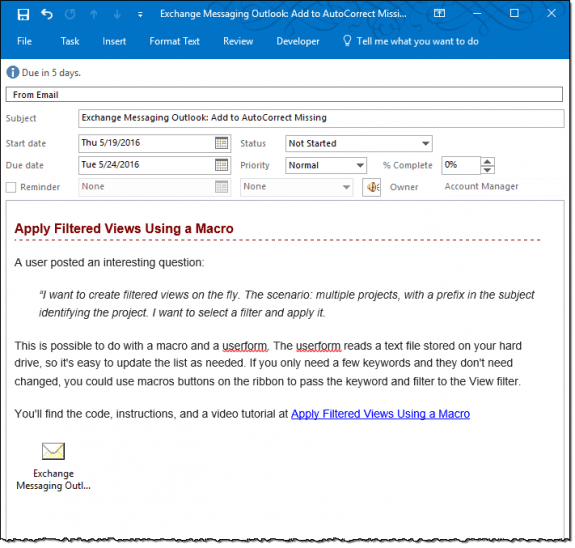 Before using this macro you need to do two things: get the GetCurrentItem function from "Outlook VBA: Work with Open Item or Selected Item" (this allows you to use the macro with open or selected messages) and select the Microsoft Word Object Library in the VB Editor's Tools, References. You also need to have macro security set to low. 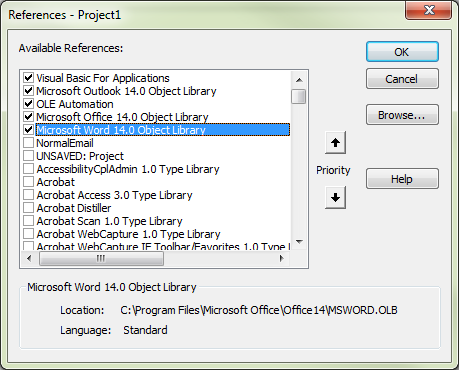 By using the Word Object Library, we can use Word's VBA commands to copy a selection in the message body and paste it into the Task or Appointment, all of which use Word as the editor. This version of the macro creates an appointment and inserts the selected text (including formatting) into the appointment body. If you want to copy the entire message body, the macro can select it for you, using .WholeStory before the .Copy line. Instead of inserting a copy of the original message as an attachment as the Task macro does, it inserts a link to the original message (the link may not work if the message is moved). This macro uses the next appointment period for the start date and time (Outlook's default). This macro creates a task with the contents of the clipboard added to the task body. As with the other macros, you need to set a reference to Word's Object library in Tools, References. .ReminderTime = .DueDate + "2:00:00 PM"
Commonly used libraries are Microsoft Word, Microsoft Excel, Microsoft Forms, and VBScript Regular Expression. Another question. Is there a way of adding to the task any attachments that came in the original message? That is actually the only reason i need to attach the original message: to be able to access the attachments that are in the original message. But if there is a way of copying the text and adding the attachments, that would make it. Thank you for your quick response. I'm glad to know it can actually be done. I'm not very good at VBA, so after trying for a couple of hours to figure it out on my own and not succeeding I figured it would be easier to ask. Could you send me how the whole macro goes? (The one to create the task with the text and the original message attached works fine, I would just need to add the part of adding also the attachments). I hope it is not too much to ask. Thank you for your response. I already added the copyAttachments function at the bottom. I didn't understand the part of adding the CopyAttachments oItem, oTask part. Where and what exactly would I have to copy into the macro? Great Macro. It has saved me a lot of time. One question. Is there a way of having the original message attached at the beginning of the text and not at the end? I guess it's a matter of changing the order of the commands in VBA, but I haven't been able to figure it out yet. It might be possible using word object model to insert the attachment object at the top. I don't think i have any code samples that do that using an attachment though. How about adding a calendar appointment to a shared calendar, and pasting the clipboard contents into the body? I've gotten close, but can't seem to make it work. Thanks!!!!! I use https://www.slipstick.com/developer/code-samples/create-outlook-appointment-from-message/ to copy a message body to an appointment. What would I need to add to the script if I want the original message deleted from the inbox after the task is created? add objMail.Delete after the task is created. I have the Microsoft Word 16.0 Object Library selected in References? That should be the cause of that error. If you didn't have the GetCurrentItem Function, i'd expect a different error. Try unchecking it, click ok then reselect it. .Attachments.Add objMail does not seem to be working for me. I had that problem and fixed it by changing the order in the code - but i thought it wiped out the text in the body if its too high up the list. There is no error message. I tried moving outside the End With and that did not work. Adding your CopyAttachments method before objTask.Attachments.Add objMail does work. Strange since CopyAttachments is simply doing an Attachments.Add. Copyattachments is needed to move attachments from one item to another and shouldn't be needed for this. That worked for me also. Thank you. I am using CopyAttachments because I am trying to turn the entire email into a task with a copy of the email and the attachments at the top and the entire formatted email body below the attachments. Can you please share the entire code as i was trying to do the same with no success (and with no knowledge at coding). Getting the whole mail as attachment worked but i want the mail attachments. I've tried adding the below lines before the .save ( as i've seen else were in the site but it didn't work). if you want just the attachments in the message, you need to get the attachment collection, save them to the drive then add them to the task. Saving to the file system as a .msg works.